Amber Whitted is a gifted author and performing artist from Chicago's southern suburbs. Inspired by family to develop her gifts at an early age, she has filled multiple journals with her personal poetic thoughts. "It is my goal to tell our stories in a way that uplifts and tells the honest truth. We are a people with a rich heritage and amazing stories; it's time we hear them in a positive light." 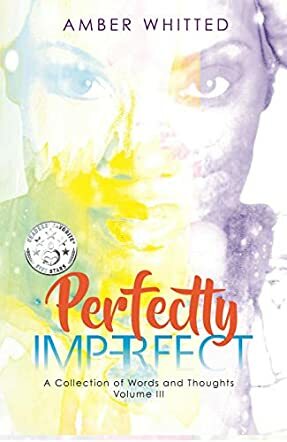 Perfectly Imperfect by Amber Whitted is the third volume in a series composed of her words and thoughts about a variety of topics. To be honest, I have not read the first two volumes. I had not heard of her until I decided to read this book. I usually prefer prose. But it is a testament to the power of her words that I plan to go back and read those first two volumes. Perfectly Imperfect moved me and that’s what I want any book to do. I am not an avid reader of poetry, but I respect the power of words in the hands of a master. Amber Whitted is a master and I am a new fan. I think you will be too. Her thoughts flow but she adds enough structure so that there is no doubt as to her themes and the meaning she is trying to convey. I really enjoyed Perfectly Imperfect and I am very pleased to discover Amber Whitted. I related to the subjects she chose to expound upon in this volume. My personal favorites are Identity, The Heart Knows Why, and the poem for which the volume is named, Perfectly Imperfect. This theme has resonated with me my whole life and it was a pleasure to hear Amber’s thoughts on the subject. Her voice is strong. Her message is clear, but more importantly, what she commits to paper is authentic. I strongly suggest that you try her work. Find a quiet place and read a few of her poems. You will not regret it. Each of us has more inside us than what we express to the world. We have thoughts, dreams, feelings, ideas and yet, each of those things can fade into the background. Expressing yourself, however, and truly coming to understand the beauty and the amazement of the world and the people within it is complex. There is much to love about each person on the planet and each of their interests and more. Whether it’s staying in bed on a lazy Saturday morning, recognizing our own flaws, enjoying our best moments or helping others, there is a great deal to understand about the world around us and all of those in it with Perfectly Imperfect: A Collection of Words and Thoughts Vol. 3 by Amber Whitted. This book of poetry is going to make you think and it’s going to make you reflect. You’ll see some of the best things about each of us and the worst things about each of us. You’ll see plenty about what everyone is looking for and what we need. These poems each make you look around you with new eyes and help you to see the beauty and the disaster of everything. They’re unique and imaginative and paint plenty of pictures with words. Each one is a way to really understand the self and if you really love poetry, you’re definitely going to love Perfectly Imperfect by Amber Whitted. These poems will really make a difference in how you perceive life around you and help you to relax and enjoy your time. You will love this collection.